Opus and Bill cartoon on youtube (20 minutes) with listening questions broken into 5 sections to pause and discuss. The video is humorous and heart warming, with a moral about everybody having a different special talent and appreciating your own self. 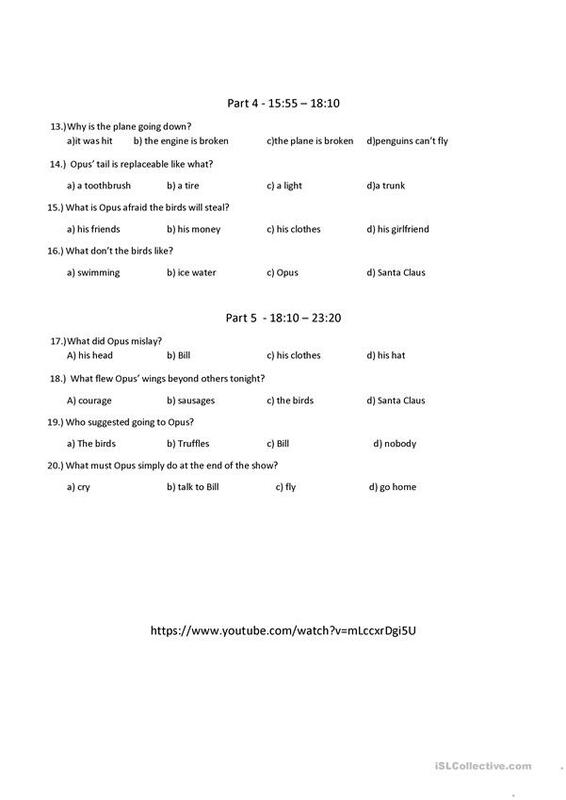 The link to the video is on the bottom of the worksheet. The present downloadable teaching material is a great resource for high school students, elementary school students and adults at Intermediate (B1) level. It is useful for developing your pupils' Listening skills. It centers around the vocabulary topic of Holidays. Joscelyn2 is from/lives in United States and has been a member of iSLCollective since 2014-06-02 04:24:21. Joscelyn2 last logged in on 2018-12-07 02:41:30, and has shared 3 resources on iSLCollective so far.